I was making lemon tarts to take to friend's house after his mother passed away and thinking that food is such a universal way of giving comfort and showing we care for someone. Slurrpy .com has put together twelve bloggers, from five continents, to celebrate the common ingredient in cooking. That ingredient is love. All twelve bloggers are as different from each other as you could imagine and yet, we all care about the food we make; where it comes from and how it is prepared. We are much more alike that it seems at first glance. We step over walls of politics, faith and culture to become global friends, with food as our common ground. I'd say that embodies the spirit of Christmas for me. Each week we are given two ingredients to use in a recipe of our choice. We are asked to use recipes that anyone can make, with no special equipment and minimal preparation. These are dishes that are made by people living busy lives, not trained chefs with a fully staffed kitchen. I do admit to having quite a bit of cat help in the kitchen but I certainly don't have a sous chef! This week our ingredients were cinnamon and pear. I can't give you the full recipe here because I wrote it for Slurrpy.com so you'll have to head over there to see all this weeks pear and cinnamon creations. Click here to head on over. I took the clafoutis over to my sister and brother in law and it passed the taste test with flying colours! Clafooutis - new to me, looks wonderful. Have a lovely week. I've heard of Clafoutis but never tasted it, it looks delicious and I'm sure tastes even better with maple syrup. I have never heard of Clafoutis but it looks delicious. I love your can of maple syrup which looks very Canadian. :) Enjoy the weekend. Oh, this was delicious. As I took my first taste I couldn't believe how GOOD it was. Thanks for sharing this feast for Paul and I. Beautiful! Happy to be partnering with you! Mmmmm,...sounds lovely and what a neat idea for this different yet the same recipe sharing. Looks so good Maureen. Hopped over to Slurrpy.com. Looks easy to make. It's gorgeous, Maureen! I can't live without my maple syrup and it's the only thing I ask for when family visits; there's NOTHING like it in the world! What a lovely challenge to be asked to participate in. Based on the pictures of your scrumptious creation, I think they asked the right person. That sounds like fun I'm always curios what other countries do, off to get the recipe and check out the rest of them. Oh what fun! I'm off to check it out! I have to tell you that I made a raspberry clafoutis a couple of weeks ago and it was my first dessert fail in years. I was stunned. I was way to busy talking to my guests and for some reason I put in salt instead of sugar. Oh Maureen, it was completely inedible! So embarrassing! 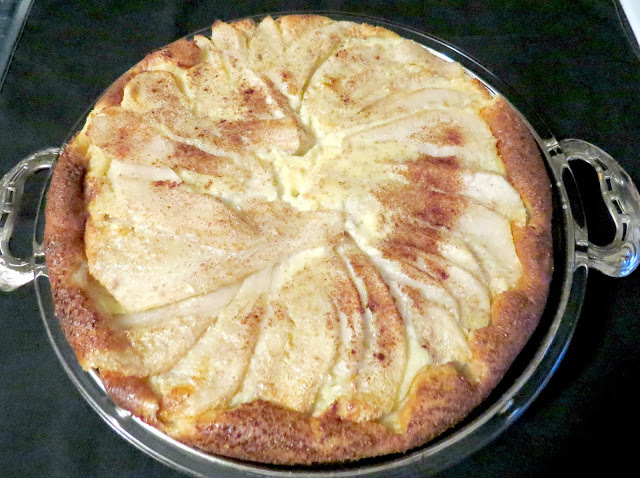 I'm off to check out your pear one now because it looks divine and I haven't given up on clafoutis...just talking while cooking! Wow, that looks great!!! Yep, food is love! Have a very Merry Christmas! YUM! It looks delicious Maureen! Yup, food is an international language. Congrats on being selected. Oh, what a beautiful dessert, Maureen. You are great in the kitchen! 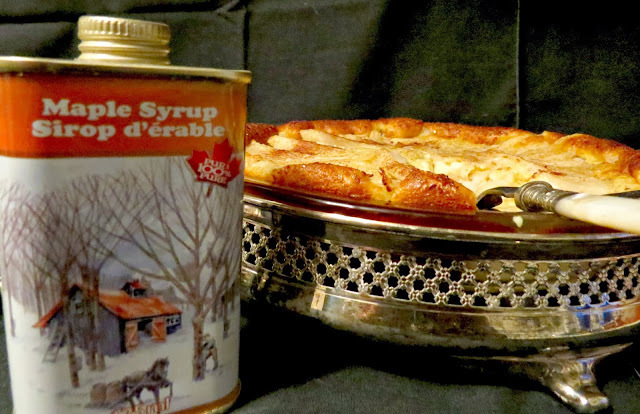 Oh my, this looks delicious and I love, love maple syrup! Congrats on writing for Slurrpy!